Gluten Free Phyllo Dough (Fillo) and Spanakopita | Great gluten free recipes for every occasion. Gluten free phyllo dough. It’s here it’s here it’s finally here. You have been asking and asking, and I have been testing, avoiding, testing more. And wringing hands and gnashing teeth. You wanted to make gluten free baklava (me too!) and spanakopita (count me in!). Your mother in law wants to make her beloved son all of his favorites for the holidays, and nothing else will do. No pressure, though, right?! After all that, it’s really not so hard at all. Go figure! But once you’ve made gluten free flour tortillas, fresh gluten free won ton wrappers, fresh gluten free tortellini and only the very best thick crust gluten free pizza in the world, I guess I should have known that gluten free phyllo (fillo?) dough was totally doable. As you might imagine, it really is best if you read through the directions at least once alllllll the way through before you start making and rolling and baking. Part of the secret, though? Your first run at the dough, you won’t attempt to roll it as paper thin as you will make it in the end when you use it. Because it’s no fun to make phyllo dough unless you can envision all that you can do with it, I’ve included a recipe for gluten free spanakopita. 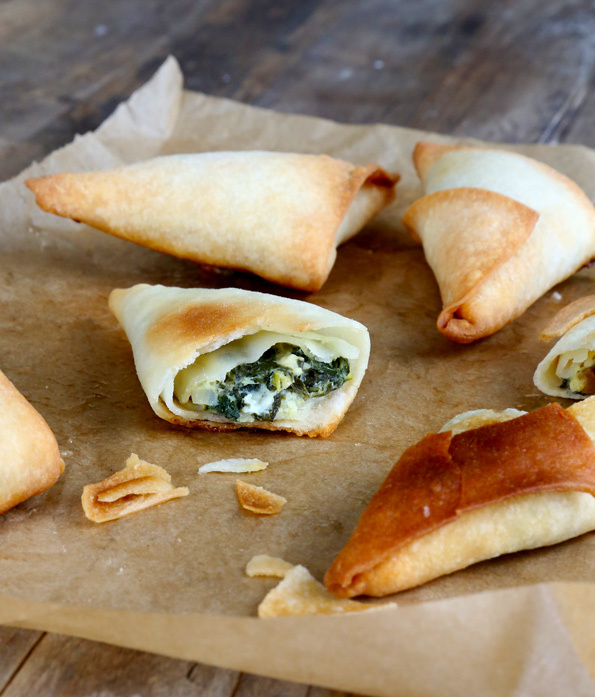 If you’ve been waiting and waiting for the recipe for this thinnest of Greek pastry doughs, you probably already have your own Very Best Way to make things like spanakopita. By all means, use your favorite filling instead of mine! But do read through the spanakopita directions here and use my methods for handling the dough. And although homemade phyllo dough isn’t going to be as machine-thin as, well, phyllo made by machine, it still bakes up light and buttery and flaky thin. Just like you remember. Because in case I haven’t mentioned it before, if they can make it with gluten, we can make it without. And that’s a promise. If you miss it, we’ll bring it back. Just you wait and see!! *For information on where to find Expandex, please see the Resources page. For information on how to replace Expandex with Ultratex 3, readily available in most countries outside the United States, in the gluten free bread recipes in GFOAS Bakes Bread, scroll to #6 in Resources. I have not yet tested Ultratex 3 in this recipe, but I would recommend trying a mix of 547 grams all purpose gluten free flour + 28 grams Ultratex 3 in place of the blend above. Ultratex 3 is at least 3 times as strong as Expandex. To make this recipe without Expandex or Ultratex 3, you can try replacing it with more all purpose gluten free flour, but you’ll have to experiment as I haven’t tried it! Make the phyllo dough. In a large bowl, place the all-purpose flour, Expandex and salt, and whisk to combine. Create a well in the center of the dry ingredients and add the olive oil, lemon juice and water, and mix to combine. The dough will come together and be thick. Press together into a ball, cover with a moist tea towel, and allow to sit for about 20 minutes. The dough will stiffen a bit as it absorbs more of the water. Pull off golf ball-sized pieces (about 3 ounces by weight) of the dough, and press into a disk with your fingers. Place the dough on a clean, flat surface and roll into a rough rectangle about 8-inches long. Sprinkle lightly with flour, and roll into a rectangle about 12-inches x 10-inches. Using a sharp knife, pizza wheel or pastry cutter, trim the rough edges of the rectangle into a neat rectangle that is about 10-inches x 8-inches. Dust both sides of the dough generously with more flour, and set aside on a piece of parchment paper. Gather the scraps and return them to the remaining dough. Repeat with the rest of the dough, layering the pieces of rolled-out dough on top of one another, each dusted generously with flour to prevent sticking. The dough can be frozen for later use, then thawed at room temperature before using. Make the spanakopita. In a heavy-bottom saucepan, heat the olive oil over medium heat. Add the diced shallot and cook, stirring occasionally, until translucent (about 4 minutes). Remove the cooked shallots from the pan and set aside. Add the fresh spinach, and cook, stirring occasionally, until wilted. Remove from the heat and allow to cool. Once cool, place the spinach in a clean tea towel or strong paper towels and wring out until all water has been removed. Chop the cooked, dry spinach roughly, and place in the medium-sized bowl with the cooked shallots, feta cheese, egg, salt and pepper, and mix to combine. Set the filling aside. 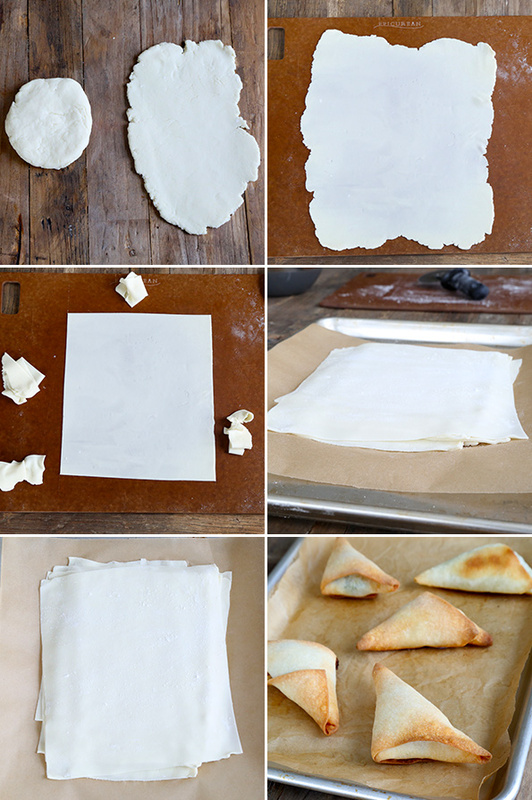 Place 1 sheet of fresh phyllo dough on a lightly floured surface, with the short side of the rectangle facing you. Sprinkle lightly with more flour, and using a sharp knife, pastry wheel or pizza cutter, cut the rectangle in half lengthwise so you have two equal rectangles, each about 10-inches x 4 inches. Separate the rectangles and roll each away from you so that it is about 11-inches x 4-inches (or as long as you can make it without the dough tearing). The dough should be nearly translucent. Brush each rectangle generously with melted butter. About 1/2-inch from the bottom of each rectangle, place about 1 tablespoon of filling. Pull one of the bottom corners of the rectangle of dough up over the filling on an angle (toward the opposite side of the dough) to make a triangle. Brush the top of the triangle with more melted butter, and fold it over on itself again toward the other side of the dough rectangle (see photos). Brush again with melted butter, and continue to fold the dough, brushing with melted butter each time, until you reach the top of the rectangle. Repeat with the other piece of dough, and then more sheets of phyllo dough and filling. Place the spanakopita on the prepared baking sheet, about 1-inch apart from one another.Place the baking sheet in the center of the preheated oven and bake until lightly golden brown all over (about 20 minutes). Remove from the oven and serve immediately. Adapted from Dima Sharif, as requested by readers many times over! P.S. Which Gluten Free on a Shoestring Cookbooks do you have? There are 3, and there will be 4! Would Cup4Cup flour work in this recipe or should I stick with the Better Batter? I literally just screamed out in joy when I saw this post!!! My mother in law will be SHOCKED (and beyond happy) that I can make baklava! Thank you, thank you, thank you Nicole! Funny enough, I had to adapt one of her recipes today to make “asure”, a traditional Turkish holiday dish. Looking forward to adapting her baklava recipes. This also opens up the beloved world of boreks… So many Turkish dishes are now more accessible! I’m curious if you tested and cried with C4C? That’s my main flour. Just curious if it was an epic fail or not tested. Thx! These look very nice. For many, phyllo is sort of the last frontier for GF baking. Dimitrios Douros has been making GF phyllo for years the ‘old fashioned way’ just like his greek mother. Rolls out the dough with a 1/2″ wooden dowel. His baklava is made with 8-12 sheets of phyllo. He recently used your GF mix with incredible results! Thank you, thank you, thank you! I love you for all you do for us! I’m afraid I’m really not following your question, Ursula. 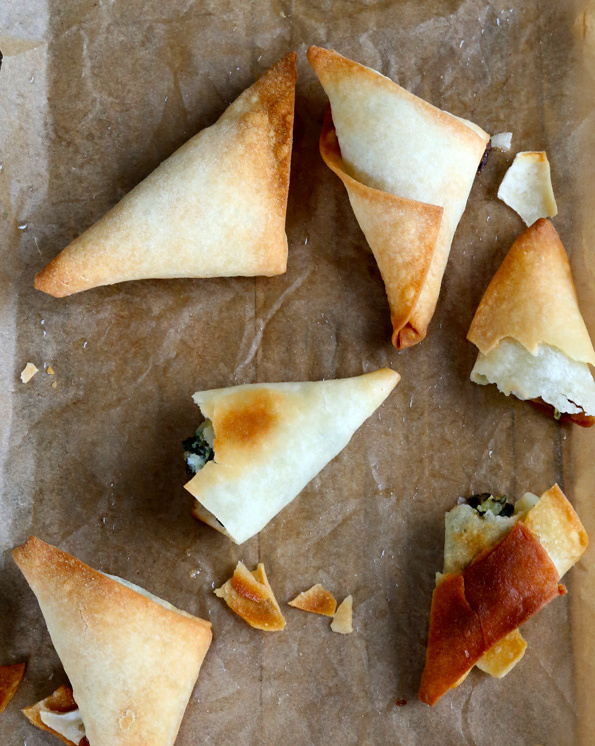 I have included a recipe for spanakopita triangles, which are not layered really as they are folded over and over. You use this recipe as you would any phyllo dough. That’s awesome, Barbara. Just awesome. Thank you, thank you, thank you, thank you, thank you, thank you, thank you!!!! Now I want to retire this minute and just go home and bake. Baklava here I come! Oh, shame on me for not thanking you for this and all your hard work on our behalf! I do not know what I was thinking! Please forgive me–I will try to do better next time! Hugs and Kisses!! As someone of Armenian heritage, thank you!!! If I wanted to make these ahead and freeze them, could I freeze them unbaked, or should they be partially baked? I can’t wait to try this! 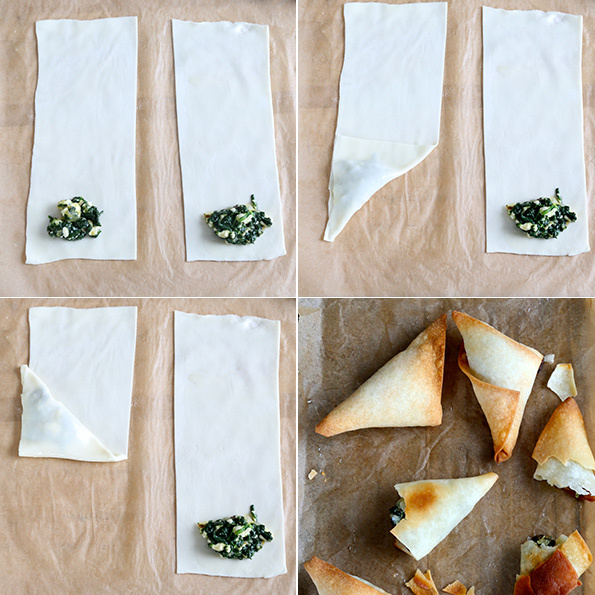 You can definitely make the spanakopita ahead and freeze them raw. Then, bring to room temperature before baking and bake as directed. It should work great, Carolyn! Hilma is coming today! Between this and the the croissants, she will be busy! You know she is such a better (calmer, less stressed out) baker than I am. I’m reasonably capable, but she rocks!